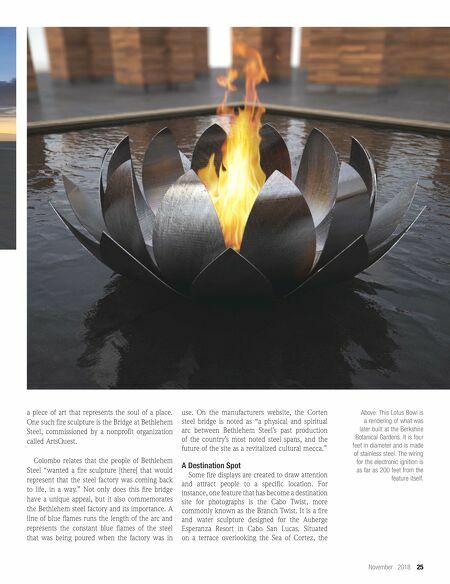 24 Landscape Architect and Specifier News With the evolution of fire usage, designers and builders, such as Elena Colombo, are completely transforming fire into state-of-the-art features that provide more than just warmth. They are creating masterpieces beyond the traditional fireplace that make you exclaim, "Wow, that is incredible! How do they do that and how can I get it!?" Well here is how… Fire Features Colombo's design and build firm, Fire Features, creates distinctive works including firebowls, markers and sculptures. Colombo works with both landscape architects and landscape contractors to design and construct her art. Landscape architects may look at the website and determine if they want something similar for their project, or Colombo might be asked to create something of their own design. According to Colombo, because outdoor gas fireplaces and fire features are still relatively new, and there are many different ways that a feature can be hooked up, it is a good idea to plan the installation well in advance. The Spirit of a Flame Sometimes, there is more to a feature than just its functionality and aesthetics. Sometimes, something can be crafted for sentimental value, as We all know that fire is most commonly used as a heat source. In the natural environment wildfires spread, burning vegetation and destroying animal life in the process. Yet, the use of fire has evolved drastically over time as man learned how to make and control it. It is used as a tool to illuminate the night, and in the early days, humans used fires for rituals and to warn off predators. It serves other functions such as clearing land in agriculture, signaling, cooking, and keeping a home warm on winter nights. 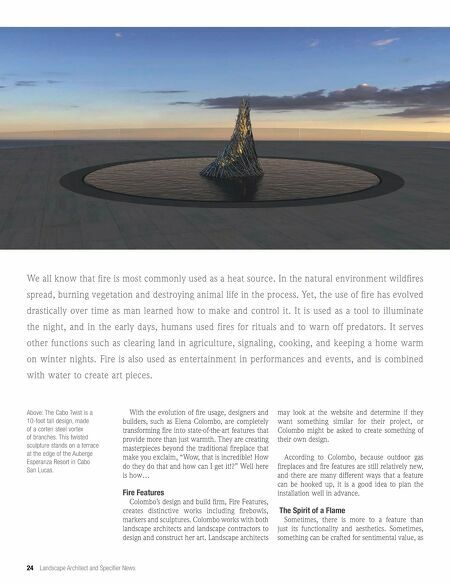 Fire is also used as entertainment in performances and events, and is combined with water to create art pieces. Above: The Cabo Twist is a 10-foot tall design, made of a corten steel vortex of branches. This twisted sculpture stands on a terrace at the edge of the Auberge Esperanza Resort in Cabo San Lucas.